The Library is intended as a place of quiet study. On floors 4-10, we expect individual quiet study, with the 10th floor designated as a silent study floor. Individual study – no talking or whispering, and use of cell phones elsewhere. Individual study – no talking or whispering, no use of cell phones, minimal and quiet keyboarding, mute all audio and no eating. If you need to talk to your classmates, please consider booking a group study room online. Group study rooms are located on floors 5-9 of the Library. Low level discussion will be permitted in the group study rooms on those floors – due to lack of soundproofing, the level of group discussion must be respectful of the “absolute quiet” culture of the floors as a whole. If you need to access a computer, floors 2 and 3 have the most workstations available. You can see real-time availability of desktop computers and lendable laptops on the Library website. For quiet work with a computer, please use the lab on the 6th floor. 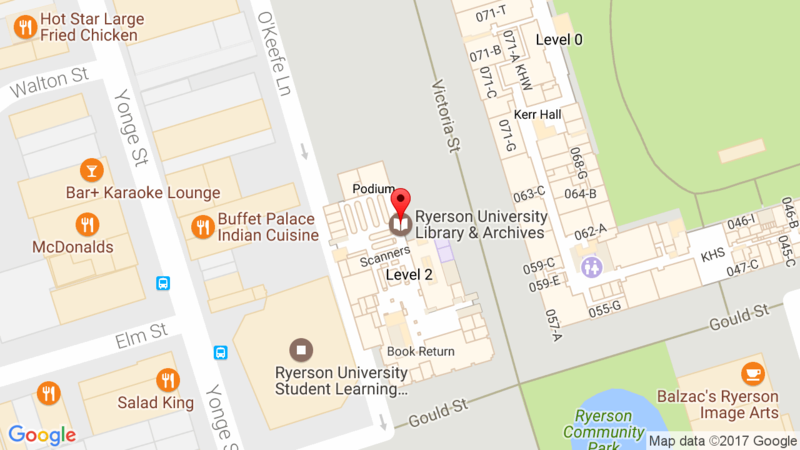 Please note that an additional 8 floors of study space is also available in the Student Learning Centre (SLC) at Yonge and Gould Street, easily accessible through the connection on the Library’s main floor. Collaborative work rooms can be booked for group study, and a card-accessible quiet study space for grad students is available on the 7th floor of the SLC. If you are unfamiliar with study space in the SLC, please note that daily tours are available at 12 p.m. during the week, starting at the Welcome Desk near the entrance doors. Students can register for a tour to learn about the different options for study space available in the SLC.